Mar. 13, 2014 6:00 p.m.
"Immensely frustrating." Those were the words that Leduc County Mayor John Whaley used to describe the entire process surrounding the annexation proposal coming from the Town of Beaumont. Since the sudden notification to Leduc County back on April 30, 2013 that the Town of Beaumont was wanting to annex 24 quarter sections of land from the County, the two Councils have been in discussions regarding this proposal. So far there have been fourteen mediated meetings held but that process was abruptly ended when Beaumont Town Council, acting on a decision made in camera at their Feb. 11, 2014 Council meeting, decided to adjust the perimeter of their proposed annexation and formally file it with the Municipal Government Board. The adjustment on the lands reduces the proposed area down to 21 quarter sections from the original 24. It removes the northernmost 4 quarters bordering each side of 50th Street up to the City of Edmonton's boundaries but extends it one quarter section to the west along TWP 512. This redrawing still leaves four quarters trying to be claimed by both Edmonton and Beaumont in separate annexation proposals. The formal filing of the proposed annexation has now halted all mediated discussions between Beaumont and County Councils. In what was originally supposed to be a joint information session hosted by both Beaumont and Leduc County on the evening of March 3rd at Coloniale Golf Club, the Town of Beaumont backed out from the event shortly before the date. County administration was still hoping to see Mayor Berube attend the event but instead the Town had representatives who sat and listened in the audience. Representatives from the City of Edmonton were also present in the building. The County opened the evening with a slide presentation narrated by the Director of Planning and Development for Leduc County, Phil Newman. To begin, Phil asked for a show of hands as to how many County residents were in the audience and when the majority of hands went up he jokingly commented that the County was glad to see they were reaching the right audience. 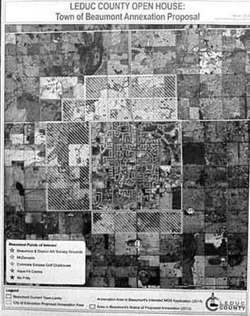 Stating that the County had put forth a "fair amount of effort trying to reach an accord," with the Town of Beaumont the County still had a number of concerns with the proposal including residential density numbers, locations of growth and its management, drainage, east-west utility lines and stakeholder involvement. Phil commented that even though it was on screen in the presentation, he has an issue with the word "stakeholder". He felt that when it describes landowners within the affected area that it makes things "…less personal, and this is intensely personal when you are dealing with people's land." Approximately 88 people living in 27 occupied dwellings within the proposed annexation areas will be directly affected should it be approved. For the affected landowners residential taxes would increase by 76% and non-residential taxes would increase 10% with no increased services. Commenting on the recently halted discussions, Leduc County Mayor Whaley said, "They haven't gone well. We are disappointed." Continuing to comment on the annexation proposal itself he stated, "The position of the County is that this is a high priority growth area and we need to plan it the right way. It's tough. We are not against growth and every municipality has a right to grow but the County is struggling to find a good reason to give up more than 12-14 quarters according to residential density projections over the next 50 years." The current density in Beaumont sits at just under 17 residential units per hectare and according to numbers pulled from their own projection the Town envisions just under 19/Ha over the next 50 years. The Capital Region Board is calling for densities of not under 25 residential units per hectare. One resident questioned as to whether this proposal would be an, "all or nothing thing" when the decision about the annexation was made. John replied that the decision will now be up to government to make, so anything could come out of it. "Government really doesn't want to make the decision," stated John. "They want us to make it, but the Provincial Government can make whatever decision it wants. So it’s not all or nothing." Commenting on the uniqueness of this particular annexation proposal John said, "The Board hasn't had this scenario before with two areas (Edmonton and Beaumont) fighting for the same piece of land." When it comes before them the MGB will ask both the Town and County to give presentations stating their views and arguments and they will also be holding Open Houses to hear from residents during that process. John urged residents to take advantage of the open houses no matter what their personal opinion or desires might be but it was important for residents' desires to be heard. "We (at the County) want to hear from you too," he said. "Tell us if we are off base. Let us know what you want. We are here to represent you." In closing John re-stated "We're not against growth here but let's do it right. You have to vision out ahead for the next 50 years. Will the Town of Beaumont still be here or will it be a suburb of Edmonton? It's difficult to tell."